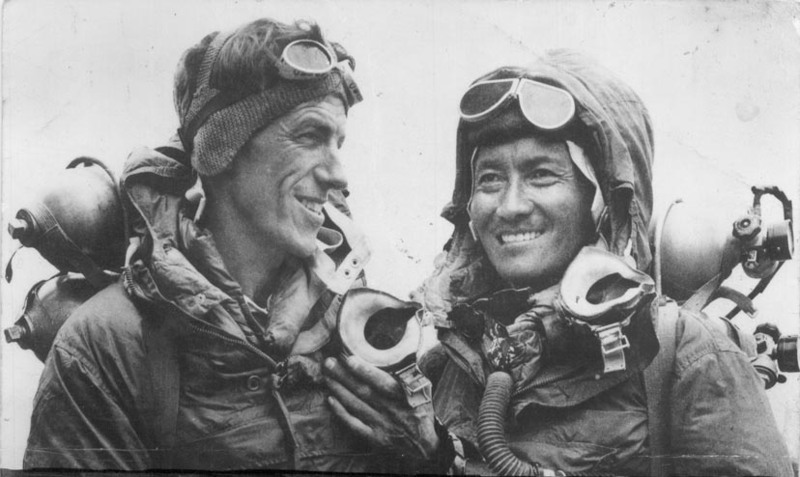 Edmund Hillary and Tenzing Norgay after summitting Mount Everest, 1953. Image: Jamling Tenzing Norgay, Wikimedia Commons. On 29th May 1953 Edmund Hillary and Tenzing Norgay reached the top of the world on a British expedition led by John Hunt. It was a tremendous achievement that captivated people around the world. News of the success reached Britain on 2nd June, the morning of the Queen’s coronation. Since then, the Queen has been a great supporter of Everest anniversary events and the Duke of Edinburgh is the patron of the Mount Everest Foundation (an expedition-grant-giving organisation set up with the royalties from the 1953 expedition). In 2012, as a relatively new member of the Alpine Club, I had the good fortune to be invited to join the organising committee of the 60th anniversary celebrations as a representative of the Mount Everest Foundation. There was going to be a big event hosted by the Royal Geographical Society. There would be daytime lectures for schools and a special evening lecture with some of the big names in mountaineering. And Her Majesty the Queen would address the audience as the guest of honour. After the lecture there would be a special reception for invited guests, which the Queen and the Duke of Edinburgh would attend. It would be an exciting event! 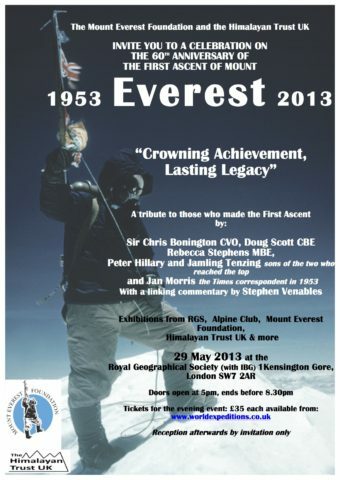 Flyer for the Everest 60th anniversary event. The presence of royalty at the event meant that security would need to be taken seriously. We would need to collect details from everyone planning to attend, and this would be a big job. I was invited to join the committee to take care of these requirements. It was an honour to be involved. I was on the committee with some inspiring men and women: Rebecca Stevens, the first British woman to climb Everest; Henry Day, retired Colonel who led the first British expedition to climb Annapurna; Sue Leyden, daughter of John Hunt; Colin Scott, Royal Airforce Wing Commander and leader of several expeditions to the Himalaya. We were working with the Royal Geographical Society, in the beautiful and fascinating home of exploration. I started learning about the history of the Everest climb and others before it. On the day of the 60th anniversary, 29th May 2013, I listened to some of the talks, met some wonderful, fascinating people and, in the evening at the reception, met Her Majesty the Queen herself. It was a quick meeting – a hello and a curtsey, a quick question from Her Majesty and she was moving on. But it was an honour to meet her, and a privilege to represent the Mount Everest Foundation in the organisation of such an inspiring event. 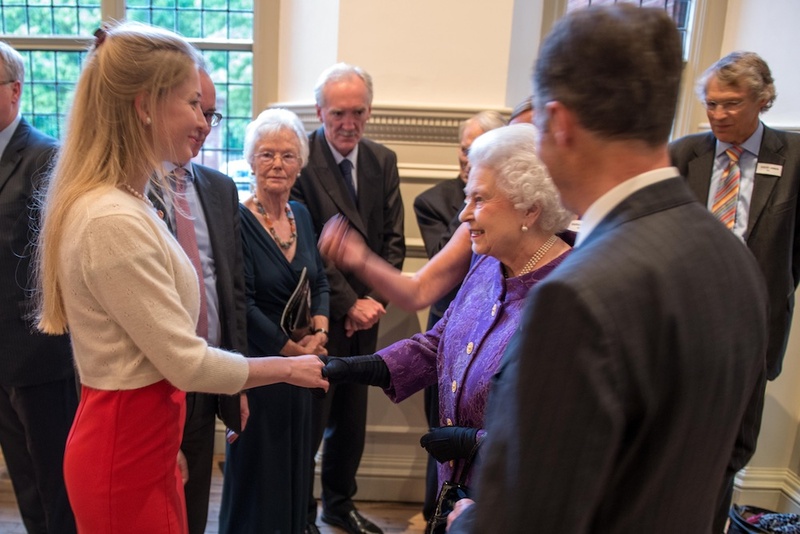 Melanie Windridge meeting Her Majesty the Queen at the 60th anniversary celebrations of the first ascent of Mount Everest. I was certainly inspired. I went on to learn more about the history of climbing Everest, about the advances in science and technology that helped make that first ascent possible, and I realised that if I built on my climbing experience, I had a chance of climbing Everest myself – of walking in those historical footsteps. Five years on and this year, 2018, I am going to Everest. I’m so excited just to go there! I’m running an outreach project to engage students with science and the mountains, hoping to inspire them in their own explorations. I feel so lucky to have this opportunity to do something so incredible, and I owe it all to Henry Day, the Mount Everest Foundation and the Queen! Read more about my plans on my Everest page, watch Science of the Summit videos on the Institute of Physics YouTube channel and follow along on Twitter and Facebook.